You can see the flicker of contempt begin in the eyes and then spread to the mouth. Food people in particular, but really any cultured Australian with a lick of pride, will sneer slightly at the first mention of Lygon Street and the food served there. "That's not real Italian food," they'll say. "I mean, D.O.C. is fine, but let me tell you where you can get serious Neapolitan pizza." The thing is, I don't want Neapolitan pizza. Actually that's a lie – I almost always want Neapolitan pizza. But when I returned to my hometown of Melbourne late last year after more than 20 years living in the US, what I really craved was a capricciosa pizza from Papa Gino's on Lygon Street. I wanted that weird stiff crust. The shredded ham, slightly burnt and crispy at the edges, piled way too high for any respectable pizza. The olives, the odd damp flavour of thinly sliced button mushrooms. I can get Neapolitan pizza almost anywhere in the world these days. I can only get Australian Italian food in Australia. And more specifically, I can only get the pizza of my childhood on Lygon Street. Before you go accusing me of blind sentimentality, hear me out. 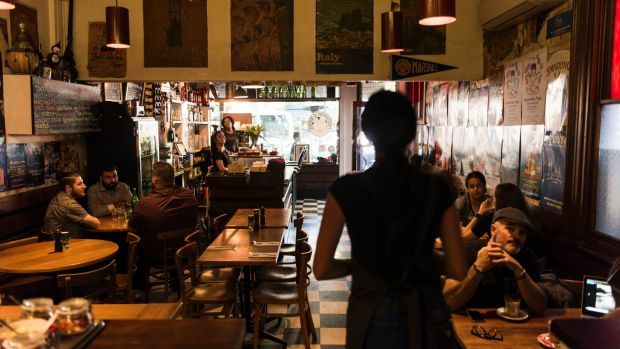 After more than a decade of working in America as a restaurant critic, after living in New York and Connecticut and California and sampling all of the pizzas I could get my hands on in those places and elsewhere, I've come to a radical conclusion: Lygon Street pizza is worthy of love, on its own merits, for reasons that go beyond nostalgia. Is it the best pizza in the world? No. Is it (sometimes) awesome and delicious and uniquely Australian? Yes. Is that enough? I certainly think so. When I was a kid, Lygon Street was full of wonder. It was the mid-1980s and everything I coveted in life, it seemed, was on those few Carlton blocks. There was Poppyshop, of course, and a few doors down a huge shop that sold reams of Lisa Frank stickers and gloriously colourful, artificially scented fruity erasers. 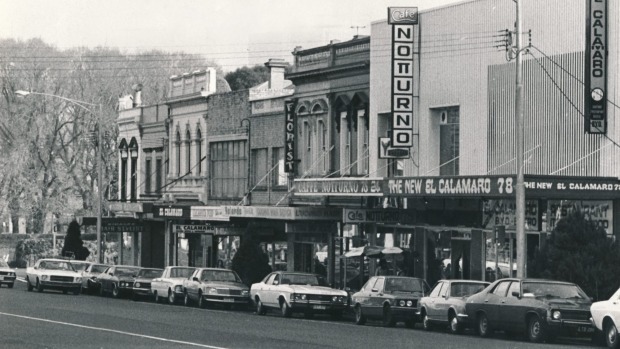 I got my first professional haircut on Lygon Street, and if I remember correctly it was home to one of the first Norgen Vaaz locations, where my father would take my brother and me to get ice-cream. My go-to order was coffee and strawberry. It is still my go-to order at ice-cream shops, and my enjoyment is still measured against my memories of those Norgen Vaaz cones. We mainly went for pizza though – the ice-cream and sticker shops were just the things my brother and I harangued our dad into before or after pizza. We went to Papa Gino's – I don't know why that's the restaurant my father was loyal to, and he doesn't know either. We rarely ate out in those days. My father was single and careful with money, and our trips to Papa Gino's were a treat. I remember the wood-panelled walls, and the posters of Italy, and the large capricciosa pizza we always ordered. I remember the bustle of the place, the stacked pizza boxes, the friendly waitresses. I have been moving from one side of the world to the other and back again since I was six months old. I have never lived in any one city or state longer than a few years. There is hardly anything static in my life; everything changes. You know what never changes? Papa Gino's. Part of what's lost in the discussion of Italian food in Melbourne is the idea that there is value in cuisine variations that are unique to this country. Australia has its own brand of Italian food that is different from the Italian food you find in the US, in England or in Italy. 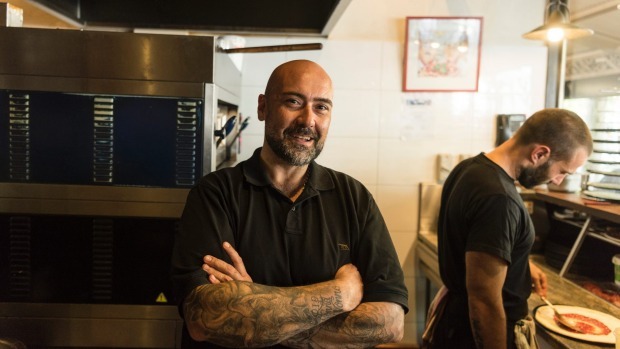 Italian immigrants came to Australia at a specific moment in history, bringing with them aspects of their culinary identity that did not make it to other parts of the world. The climate, the culture, the ingredients available, all contributed to a variation of Italian food (and Greek food, and Chinese food) that is its own thing. Take the capricciosa pizza. This is a pizza that barely exists in America. (I'm sure there is some version of it somewhere, but I have never come across it and I eat and travel for a living.) The explanation for this parallels the history of Melbourne's cafe culture. Why are there are so many cafes in Melbourne, while coffee culture and espresso have only really taken hold in America in the past 20 years? Because most of the Italians who migrated to America did so in the 19th century, before the invention of the espresso machine at the turn of the 20th century. Italian immigration to Australia happened mostly in the 1940s and '50s, and espresso migrated as well. The capricciosa was invented in Rome by Enea Dante Santerini in the early 1950s. By that point, Italian Americans were deeply rooted in the US – it had been almost a half century since there had been any major immigration in that direction. As a result their food culture was far less tied to Italy by that time. But Australia was smack in the middle of its Italian migrant influx, and those who were already here were still very much tied to the old country. So we got capricciosa pizza, and America did not. Lygon Street does not and could not exist anywhere else. In recent years in the US, people have begun celebrating American Chinese food as the distinct and delicious cuisine that it is, one that has been developing for well over a century, beginning when Chinese and American workers toiled side by side in California's goldfields. Italian American food has long been beloved, especially in the big cities on the East Coast. Recently, that love has been spreading. One of my favourite chefs in Los Angeles, a guy who gained his first real acclaim when he imported a pizza oven from Italy so he could make the most authentically Italian pizza possible, has just opened a restaurant that serves fried mozzarella sticks and hot chicken wings with blue cheese dipping sauce. America has learned to love the foods that came about when immigrant cooking adjusted to its new surroundings – not just the fusion or gourmet versions in which dishes and ingredients are "elevated" to fit the current style, but the everyday cooking as well: the General Tso's chicken; the red-sauce-laden pasta; the glorious world of regional American pizzas. Here, the phrase "Italian Australian" is barely even in our food lexicon. Things tend to be sorted into "real" Italian – meaning food that strives to be exactly as it would be in Italy – modern Italian, and food that isn't worthy of those labels and is therefore dismissible. After I'd had a few of those sneering conversations about Lygon Street, I decided to figure out what it was about the place and the pizza that remained so important in my food memory. Was the pizza really that bad? Was I misremembering the magic of that capricciosa? 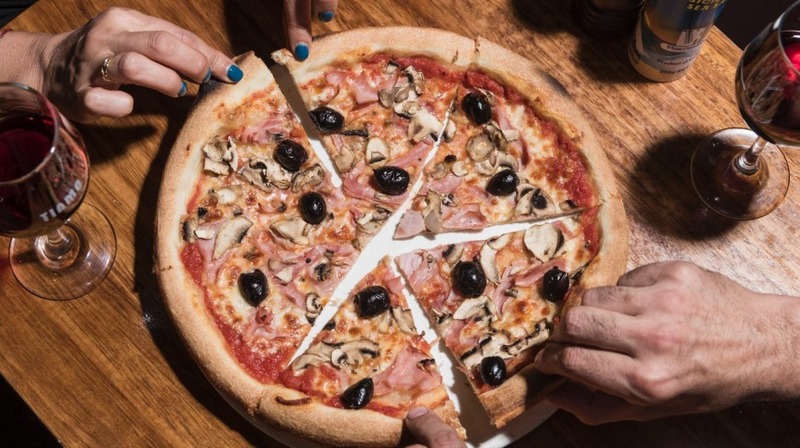 If there really is such a thing as an Italian Australian pizza style, embodied by Lygon Street's offerings, what is the best of those? I would find out. I decided I would eat every capricciosa pizza on Lygon Street. The history of Lygon Street is complicated and fascinating. To gain a full understanding of it, I highly recommend Michael Harden's excellent book Lygon Street (Murdoch Books), in which he makes a passionate case for why we should refuse to allow the cliches (that it is a tourist trap; that it is a hotbed of organised crime) to define this culturally important part of the city. He also breaks down the histories of the restaurants on the street – restaurants that in many cases have been owned for generations by the same families. Eating my way up and down Lygon Street and learning about the history of each place made me feel more rooted and at home than anything else I've encountered since returning. Before taking on this grand dining quest, Papa Gino's is the only restaurant on the street where I'd ever eaten pizza. After eating every capricciosa I could find, I can say without a doubt that Papa Gino's does not serve the best pizza on the street. Do I care? Not particularly. That's my pizza, and despite the fact that the thinly shaved sheets of ham that appear on some of the better pizzas are far more elegant, I love the pile of ham strips on Papa Gino's capricciosa. It feels regional, and that region is Melbourne Italian. I did have some pizzas that were pretty awful. This story is supposed to be a celebration of the street and not a takedown, so I won't name names, but the places that take very little care are easy to spot. The pizzas are too perfectly round, their toppings too gloppy. If you peek under the crust you'll see the telltale pinpricks that are the mark of premade frozen flattened dough. A few of these places make pizzas that appeal to the 12-year-old in me, one who just wants a vehicle for too much sauce and cheese. But they are not pizzas I can unabashedly recommend. Perhaps unsurprisingly, one of the best pizzas comes from the University Cafe, which is also one of the oldest restaurants on the street. Established in 1952 (before that it had been called the Mexican Cafe), the cafe was bought in the '70s by its current owners, the Caprioli family. But the Capriolis have ties to the University Cafe going back to its origins – Beverly Caprioli, the matriarch of the family, worked there as a young woman. These days you can still see the owner, Giancarlo Caprioli, talking to customers or working behind the counter. His son, daughter and son-in-law also work at the restaurant. The crust on the pizza at the University Cafe is bubbled and charred in all the right places. The toppings are quality. It has that wonderful capricciosa alchemy, of ham and mushrooms and olives and cheese. My pick for best overall pizza on the street is probably the one at Tiamo, a few metres away, for reasons of balance of flavours and tang of sauce. But the crust at University Cafe is the best. Is it authentic Italian food? Not exactly. It's authentic Australian Italian food. I've noticed in Australian food lovers, more so than other places, an obsession with that word: authentic. We want our international food to be exactly like it is in the country of its origin. We want to be transported. The problem with this is that it discounts the history and experience of people who are not entirely of one place or another place. Are their experiences not authentic? Is their culinary expression of that experience not worthy? I understand that Australia has perhaps not been taken as seriously as it should have been on an international stage, and that because of that we want to put our best foot forward. The modern Italian food being served in Melbourne these days is among the best in the world, and we want people to know that. Old Lygon Street is touristy, it's shabby in places, it's not ever going to be the hot new thing. But we should not discount our history – if we do, we will lose it. 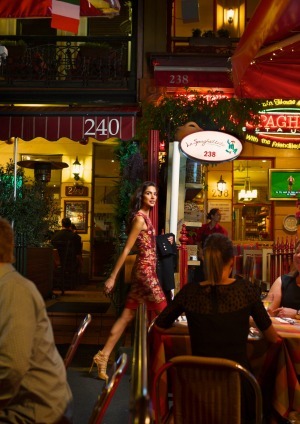 Lygon Street is authentically Melbourne, it does not and could not exist anywhere else. Much of what it has to offer is delicious. It is ours. The best capricciosas I found in Carlton were a mix of new and old school. Here, in alphabetical order, are my favourite five. This pizza is representative of the new wave of Italian food in Melbourne, food that hews closer to what you'd get in Italy. But it would be ridiculous to pretend that it doesn't serve one of the best capricciosas in the neighbourhood. Crust with great stretch, beautiful ingredients, no food snob points lost for being seen here. Another new-school place, having opened in 2015, Gemma's 400-degree stone oven makes for a wonderfully blistered crust. The chef is a purist, meaning there's less have-it-your-way flexibility than elsewhere in the neighbourhood (our request for mushrooms on half the pizza was met with scorn) but the proof is in the pizza. I am obviously biased, this being my go-to childhood pizzeria, but to me Papa Gino's is the ultimate example of the Melbourne old-school capricciosa. 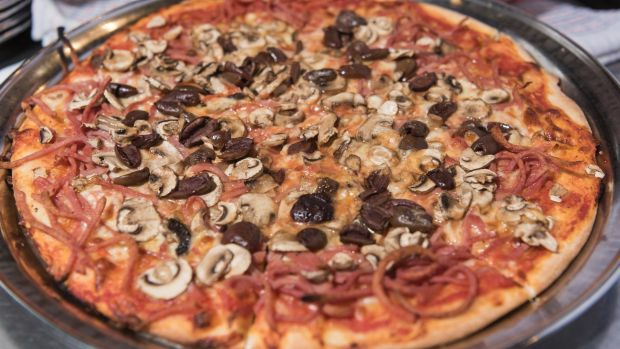 Where other places with less gourmet pretensions have slipped into poor quality, Papa Gino's serves a pizza that is anything but artisan, but it's not sloppy or careless either. I love the squiggly piles of ham, I love the tawdry excess of it all. I love that it never changes. Tiamo serves what is probably the best overall capricciosa on Lygon Street, and represents the middle ground between new and old school the best. The ham is thinly shaved, the sauce is tangy and flavourful, and the olives are high quality. 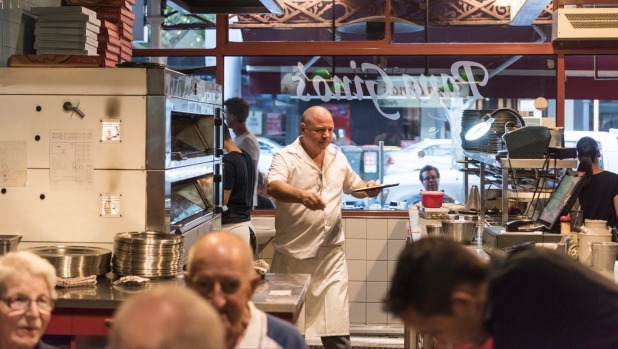 One of the oldest restaurants on Lygon Street, and one of the first locations in Melbourne with an espresso machine, the University Cafe also serves one of the city's best capricciosas. 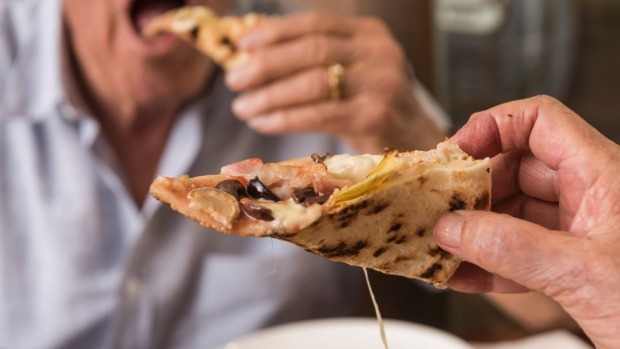 It's all about the crust here – lovely charred bubbles of dough.Thin sliced ham, artichokes, olives and mushrooms make for a wonderful and iconic meal.